A group of new Foreign Service recruits visited the Colombo Tea Auction recently as a part of their induction program. The group of new recruits numbering to over 20 was led Mrs. Pamela J. Deen, Director General of the Bandaranaike International Diplomatic Training Institute, which conducts the ‘Intensive Induction Program’ on new recruits to the Foreign Service. During their visit, the future diplomats were given a brief overview of the activities of the ‘Colombo Tea Auction’s,’ operations and its contribution to the local economy. 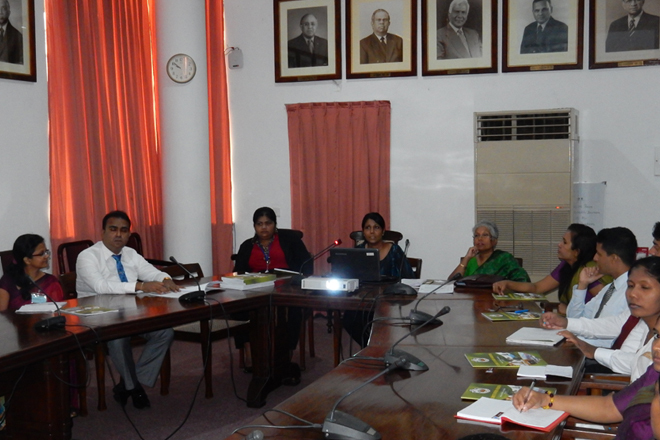 They were briefed by the Assistant Secretary General of the Ceylon Chamber of Commerce, Mrs. Gillian Nugara. In an earlier day, the new recruits were addressed by Mr. Mangala P. B. Yapa, CEO / Secretary General of the Ceylon Chamber of Commerce. Mr. Anslem Perera, President of the Colombo Tea Traders Association also has spoken to the new recruits, as a part of their ongoing induction program. The new batch has been recruited during the month of September, 2015.